Interpretive display shelter post base detail. Interpretive display shelter roof framing. Interpretive display shelter roof detail. Cookhouse as seen from the northeast. Cookhouse as seen from the southeast. The centerpiece of Collier Memorial State Park is its outdoor museum of historic logging equipment and relocated pioneer village. 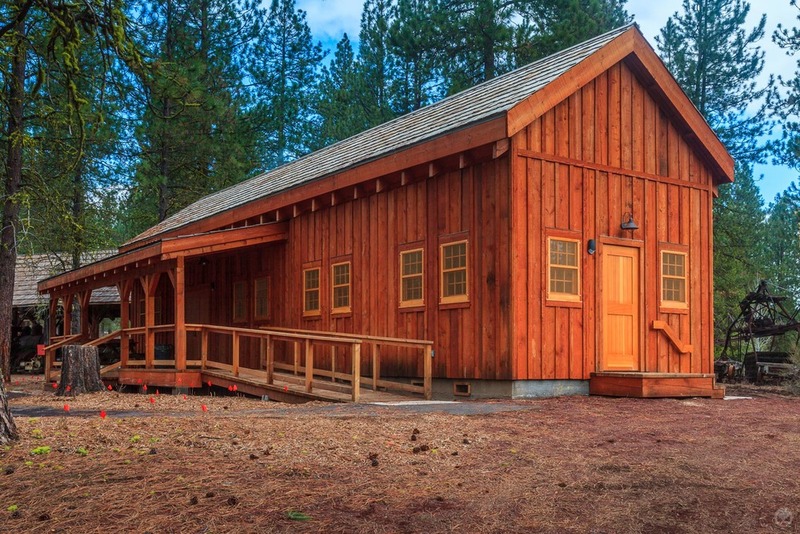 This project consisted of several small ones designed to further depict life in a historic logging camp. The process started out with the design of two different interpretive kiosks – both of a heavy timber, log construction. From there, design work progressed on a new cookhouse, bunkhouse, and blacksmith shop, as well as structural enhancements to several existing historic cabins. The project has been on-going since 2007 with the bunkhouse and blacksmith shop remaining to be built as the park budget allows. While considerably smaller than most of the projects I have worked on, these structures were no less rewarding. In fact, it was a wonderful opportunity to design within an established historic fabric and further illustrate the story of life in a late 19th century / early 20th century logging camp. Newswatch12's Ron Brown produced a short video about Collier Memorial State Park.